A breakfast of freshly picked (slightly less than perfect) arugula, parsley, two kinds of Swiss chard, and a few giant broccoli leaves from my one lonely plant, all from the greenhouse and all heirloom and organic, of course. No bounty goes to waste around here. And I love knowing that plenty of dark green leafy vegetables are making their way into our farm fresh eggs. Now if only Whitey would find the time to go back to laying them. . . The Food Blog Awards, hosted by the Well Fed Network, are going on now, and everyone is invited to vote for their favorite blog in each category. Click here for the complete list of categories and nominees. 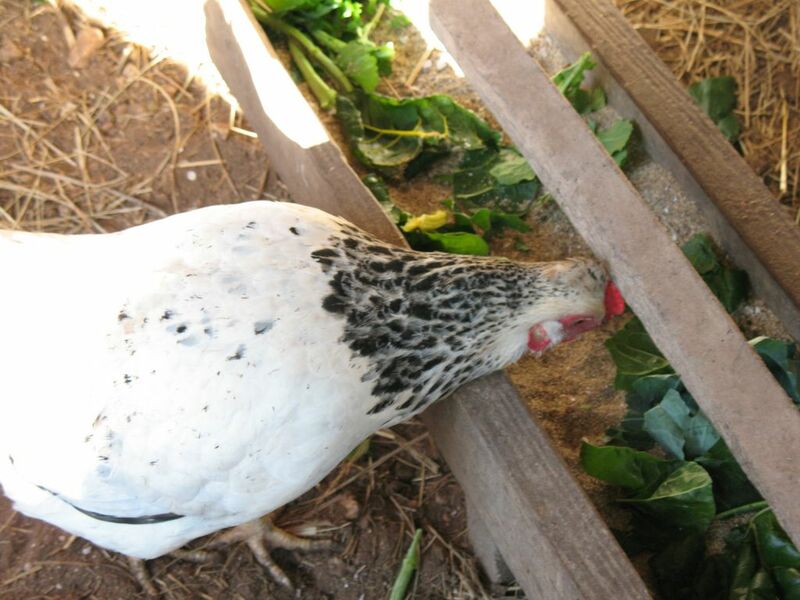 I'm thrilled that my main blog, Farmgirl Fare.com (which I consider In My Kitchen Garden to be a part of), is a finalist in the Best Food Blog--Rural category. Click here to check out my competition and cast your vote. The voting ends Tuesday January 9th at midnight EST. This is also a wonderful opportunity to discover some tasty new blogs. I've added several new items to my Farmgirl Fare Favorites Store at Amazon.com, as well as some new product categories, like Garden & Greenhouse Stuff and On My Bookshelf. Too cold to work in the garden? Why not curl up under a quilt with one of My Favorite Movies instead. Check back often, as my store is a work in progress. And since it's part of Amazon.com, you'll enjoy things like free Super Saver Shipping on thousands of items, totally secure ordering, easy returns, and of course great prices. If you'd like to read more customer reviews about any item in my store, simply highlight and paste the product name, click on Go To Amazon.com in the top right corner of the page, and paste the product name into the search box. Right now you can Save $25 when you spend $125 or more on Kitchen & Housewares or Bed & Bath products offered by Amazon.com, including items purchased through my Farmgirl Fare Favorites Store. (A few products, such as All-Clad, do not qualify.) Just enter code CLEAROUT at checkout. Things are definitely looking up in the broccoli department. 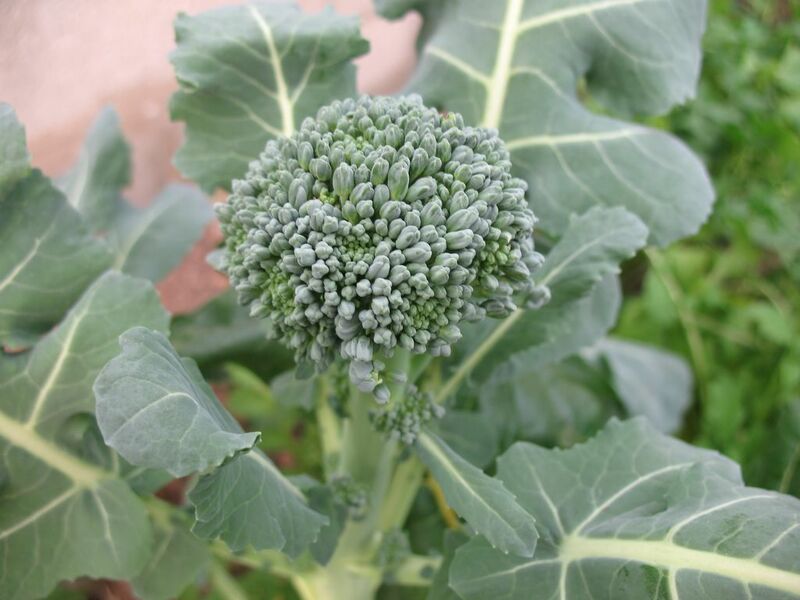 Some of my very favorite foods begin with a 'b': bread, brownies, biscuits & gravy--and broccoli. I absolutely adore broccoli. 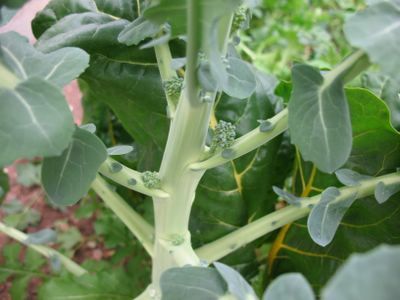 If I could only grow six things in the garden, one of them would be broccoli. And now, ten years after my only decent harvest (though not for lack of trying), it looks as if I actually can grow it. I've never had broccoli in the January garden before, and I am just tickled. This photo was taken earlier today in the greenhouse. It is either Calabrese Green Sprouting (an Italian heirloom brought to America in the 1880s) or good old Waltham 29 (a standard, open-pollinated variety introduced in 1954). Unfortunately it is not surrounded by a dozen or so other plants that look exactly like it--it is surrounded by Swiss chard (which I also adore, but not in the same lovesick way as broccoli). This was a lone seedling that I transplanted on a lark into one of the greenhouse raised beds sometime around the end of August. 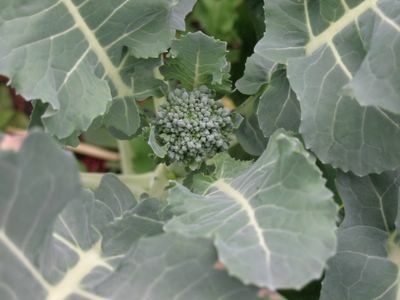 It was a volunteer that had sprouted up in a container of something else (I think a tomato plant), and I of course didn't have the heart to simply toss it into the compost bin--unlike the three containers of broccoli seeds I started last February. And am I sure glad I didn't--because the seeds I planted directly in one of the new beds on the south edge of the garden sprouted, turned into cute little seedlings with lots of potential, and were all devoured by deer or The Rabbit when I wasn't looking. I was thrilled when I noticed a tiny head peeking out from the enormous leaves several weeks ago. But while both the plant and the head have been steadily increasing in size, progress is slow. In my Pinetree Garden Seeds catalog (great seeds, great prices) it says that Waltham 29, for example, matures in 85 days. I'm never sure exactly when you're supposed to start counting the days, but this plant has now been in the ground for over 120, and it's still got a long way to go. I'm not complaining, but I am a little worried, as I read something about broccoli yesterday that I never knew. 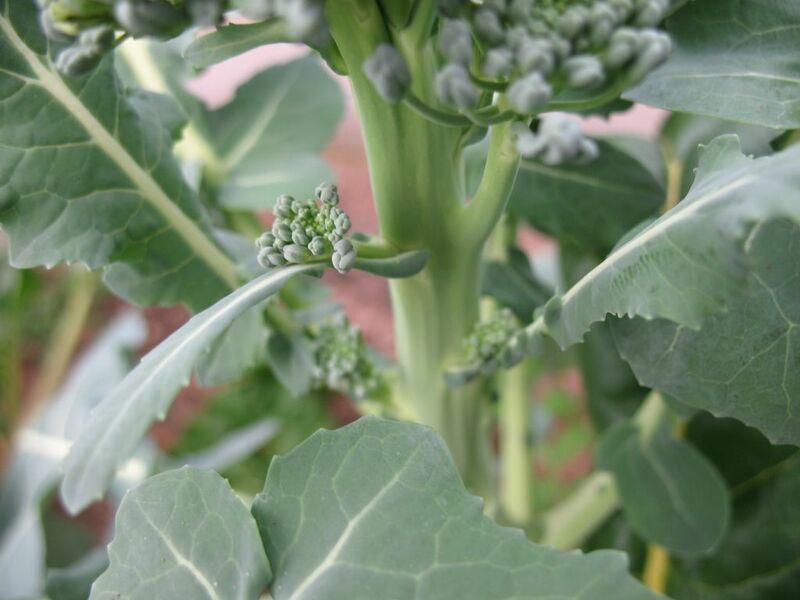 According to Ed Smith, author of The Vegetable Gardener's Bible (a wonderful book I highly recommend for any kitchen gardener), "long exposure to cold" may produce a tiny broccoli head, or button. Ack. I'm assuming that winter in Zone 5 qualifies as "long." We've already had temps down to zero degrees F, and I hate to say it, but it kinda looks like some of those buds are threatening to open real soon. It will be interesting to see what happens. On the upside, there are at least 8 or 9 adorable little side shoots poking out of the stalk below the main head, a characteristic of both Calabrese Green Sprouting and Waltham 29. These free florets will increase in size once the main head is harvested and are always a welcome bonus. No matter what happens with this broccoli plant, I'm already looking beyond it. For on January 3rd (a fertile day in the 2nd quarter--click here to find out what this is all about), I started two small containers of 2006 seeds (from my favorite Baker Creek Heirloom Seeds) that have been strategically placed near the woodstove in the living room: yep, more Calabrese Green Sprouting and Waltham 29 broccoli. This is another first. I've never started broccoli seeds this early. I am excited. Because as tasty as they are, a girl can't live on bread and brownies and biscuits & gravy alone--once in a while she's gotta get her broccoli. And I think this just might be the year I do.